Bucket Gulch or BUST! 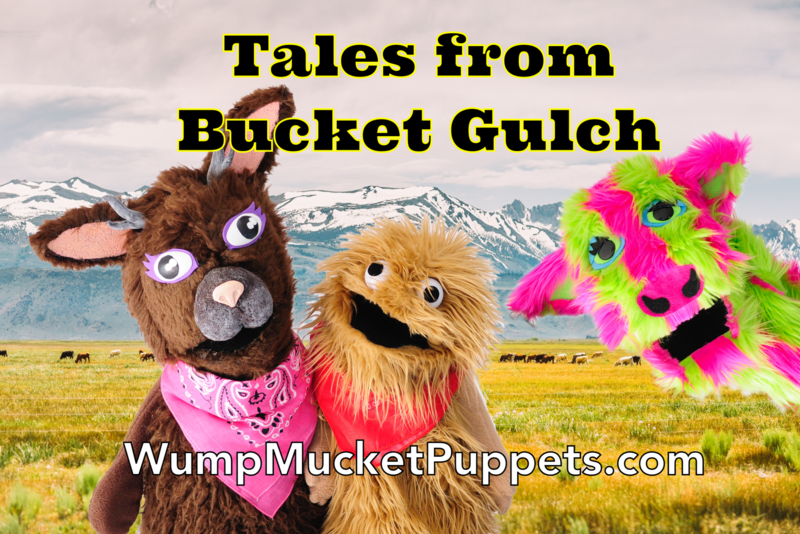 Wump Mucket Puppets western-themed puppet show Tales from Bucket Gulch is ready to hit the road, with the cast members very excited to be performing a new show for our fans this summer. We are thrilled to be featuring a new puppet star too, Sarsaparilla the Cow! The show opens with a lively tune and a tall tale about biscuits told by Miss Jacqui the Jackalope. Next Unka Unka and Kitty will be digging for gold. What will he find? This is followed by the story of The Cow Who Wouldn’t MOO, starring Coleman, Reg, and Sarsaparilla. There’s even a funky dance break for everyone to dance too! Be sure to come and see Wump Mucket Puppets this summer. We have many FREE shows to attend throughout Ohio, Kentucky, Indiana, even New England! Tales from Bucket Gulch is a great family show, perfect for children ages 3-10 and the young at heart too! Our complete tour schedule can be found right here. Be sure to get one of our new coloring pages drawn by artist Lara Rumizen. These are only available at the puppet shows. When you have colored it in, please share your art with us on the official Wump Mucket Puppets Facebook page. See ya at the puppet show buckaroos! Bucket Gulch or BUST!